This column, still in its infancy, has attempted to outline the building blocks of the Swedish Death scene. Many point to Bathory and their first two albums, 'Bathory' (1984) and 'The Return' (1985), as the early framework for the scene. Aside from Bathory, few bands had even reached a demo stage. Obscurity, a band from Malmo, formed in 1985 and released two demos in 1986. Another, Mefisto (originally Torment), formed in 1984 and released two demos in 1986. The second-half of the 1980s were ultra-important to the formation of the scene with handfuls of bands learning instruments and putting some rough song ideas together. Sorcery were one of those early bands. 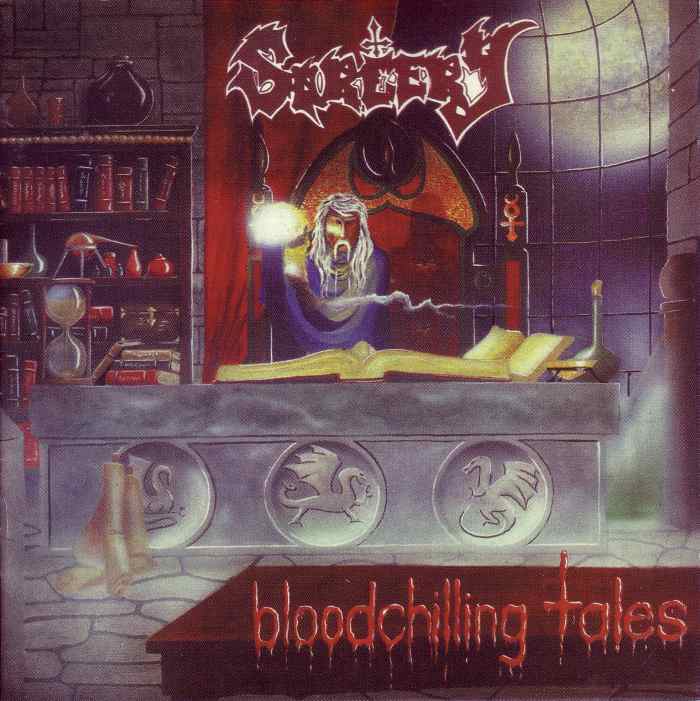 Sorcery were a band from the town of Sandviken, a locality of Gavleborg County in the southern portion of Sweden. It's a two-hour train ride to Stockholm, the proverbial home of Swedish Death. The band was founded by Magnus Karlsson-Mard (bass) and Paul Johansson (guitar, later drums), two musicians who had previously played in a band called Curse in 1984. After Curse had disbanded the two formed Acid Queen in 1985 only to rename themselves Sorcery in 1986 after singer Ola Malmstrom joined. Later, Johnasson's third cousin Fredrik Nygren was added as second guitarist. From February to March, 1987 the band recorded their first demo, 'The Arrival', at Serpents Nest Studio in their hometown. It was released independently on cassette in April of 1987. The term "occult metal" was often used (self-described by the band) to describe the early songs. The demo featured twelve total songs but two were just running silence as a joke, aptly titled "Total Silence" (Parts 1 & 2). The demo included a cover of "Master of Evil" by early Swedish act Siege. "March of the Mountain King" was originally written by Edvard Grieg in 1875. That particular song was played by the immensely popular record store Heavy Sound in Stockholm along with an early Nihilist tape. That sort of promotion surely helped promote the band. What can really be said about the demo other than raw, blackened speed metal with a heavy dose of Satanism? The vocals are sometimes macabre spoken word parts and there is a "Narration" track that is either terrifying or extremely funny depending on the listener. Needless to say, better things were coming. In 1988, a raw four-track recording took place called 'Ancient Creation'. It was circulated on tape and featured the same line-up other than new drummer Joakim Hansson. Once again, the lyrics circumvented Satanism and anti-Christian beliefs. The tape's opening title track is as dark as a hearse door, a backwards narration with tons of reverb and some eerie keyboards. This demo is a slight upgrade from 'The Arrival' with a more complex drum sound and speed metal romp. 'Unholy Crusade' followed in August of 1989, a five-song demo that showed progression. The band used monikers like "Kill" and "Infernal" instead of listing their full names on the tape's credits. There are some slower, doomy portions on the tape but for the most part it is raw speed metal. The band followed in June of 1990 with the 7" 'Rivers of the Dead' that helped set-up the band's inevitable debut record. Sorcery signed with the short lived Swedish label Underground Records (Centinex, Melissa) for their first album. 'Bloodchilling Tales' was recorded at the famed Sunlight Studios (with Tomas Skogsberg) between December 25th and 28th of 1990. It was released in August of 1991. Bassist Mikael Jansson had joined the band the year before and rounded out the consistent line-up of Malmstrom, Nygren, Johansson and Karlsson-Mard. This line-up creates one of the most memorable albums in the early days of Swedish Death metal. 'Bloodchilling Tales' is a solid first effort with ten tracks of death metal triumph. Songs like 'Immortality Given' and 'Descend to the Ashes' are hard-hitting, fast-paced songs with thrash riffing and deep death growls. The band tune down for wicked grooves, evident on the riff-centric cuts like 'By These Words' and 'Dragons of the Burning Twilight', formulas that Unleashed were working on at the time. While it's clearly death metal, some of the band's earlier black metal tendencies show on the songs "Rivers of the Dead" (sort of Venom at Bathory aggression) and "Death". The band is still mired in Satanism and has a wild take on Jack the Ripper with "The Rite of Sacrifice" (Jack is sacrificing his victims to Satan!). My favorite track still remains the opener "Legacy of Blood" with its double-bass and Slayer-like riffing. I can't help but think that Morbid Angel's 'Altars of Madness' had to make an impact on this record. After this album's release, another demo was planned for April of 1992. Karlsson-Mard left the band. Later, Fred Nygren left as well. That demo, 'Maculated', was only circulated by tape traders. This was essentially all that was left of Sorcery. By the late 90s the band had disbanded altogether. 'Bloodchilling Tales' was such an important contributor to the Swedish Death metal scene. The album would later be re-released again in 1998 and 2006 by No Colours Records, in 2008 by Metal Inquisition, in 2013 by Xtreem Music and most recently by Bifrost Records in 2016. Further, the album was remixed, remastered and re-released with 'Rivers of the Dead' bonus tracks in 2013. The label, To the Death Records, released 500 copies with different artwork and various vinyl colors. Thankfully, the band reunited again in 2009 with demos 'Master of the Chains' and 'Warbringer'. In 2013, the band's much anticipated sophomore album was released on Xtreem Music. 'Arrival at Six' shows off all the band's experience and craftsmanship. It is a phenomenal album and one that sees the band return to glory. The band released another solid full-length entitled 'Garden of Bones' in May of 2016. In March of 2017 the band's 'Unholy Crusade' demo was re-released by Spawn of Flesh Records.
. Bang The Union . W.A.S.P.